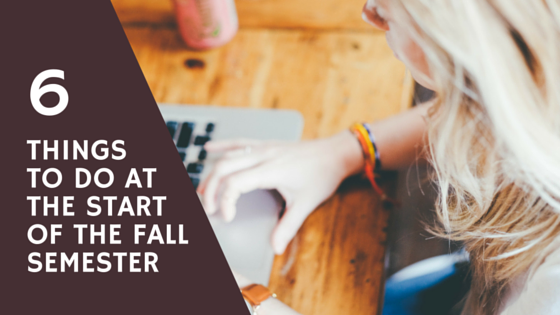 The fall semester has arrived. Maybe you don’t want to believe it, but coursework, papers and lectures are becoming a part of your daily life again. What have you done to prepare yourself for the upcoming academic year at college? What do you want to accomplish this year? Maybe you’d like to make more friends or be more social. Maybe you’d like to study more and party less. Or try out for a sport or take more advantage of the campus gym. Or perhaps there’s a club you’d like to join. Whatever your goals are, write them down someplace where you’ll be able to reference them often and gauge your progress. Same with academic goals. Are you aiming for a 4.0? Or do you want to pull your Cs up to Bs? Maybe you’d like to write better papers. Or you’re applying for a prestigious grant and need to work on meeting the requirements. Whatever your goals, keep them written down someplace. Define the steps you’ll need to take to achieve them, be it seeking help at the tutoring lab or asking one of your professors to mentor you through the grant application process. Few things are as shocking to the system as going from totally irresponsible to totally responsible within one day or two. If you’ve been partying all night (or, more likely, watching Netflix all night… ) and sleeping all day, stop. Set a date for the party to end and make it soon. Give yourself some time to start getting serious again. 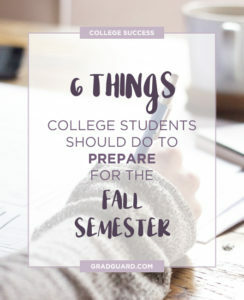 Though college life should also include fun and leisure, the point of it is earning an academic degree and you should be taking your time there seriously, not wasting it. Start waking up earlier, defining tasks to be done each day and going to bed sooner. Lay off the booze and the socializing. You’ll be glad you came back to school with a calm mind and clear head rather than stumbling onto campus with the summer’s parties still wreaking havoc on your body. Plan your semester and year. Welcome the support of your parents and suggest ways they can help keep you on schedule. College requires an awful lot of reading. If you haven’t been spending any time reading over the summer, you might want to crack open a few books to get back into the swing of things. If you know what courses you’ll be taking next year, read books that are related to those topics to get ahead on classroom discussions. If you’re not sure what to read, here’s a curated summer reading list for college students from the Washington Post. College fees and tuition, books, food, entertainment can all put a strain on your budget. If you’re a returning student, you should have a good idea how much money you spent the previous year. Take a look at areas where you could save or, if money is an issue, consider getting a part-time job while in school to supplement your spending. Most colleges have a job board posted in the student lounge, library or counseling centers. Make sure you have your financial situation sorted out before returning to college, so you can be the first in line for highly coveted on-campus jobs. Be careful with your expensive property. Your backpack can be filled with thousands of dollars of electronics and books. Easily resold by thefts that are looking for an easy buck. Be sure to get a renters insurance policy that is designed for students – a low deductible plan that offers real coverage for your property and personal liability such as the one offered through GradGuard can really be helpful. Better than expensive stuff – bring to campus framed photographs of friends and family, a tupperware of your mother’s cookies, your high school yearbook or some other memorabilia. Even though you have your friends at school, sometimes it can be hard to be away from home. Bring something with you that will help when you miss your friends and family. Student health issues are real. The stress of living on your own and being in an active community can expose students to illnesses and injuries that can disrupt your education. Take a moment to consider what will happen if you are forced to withdraw from school mid-semester. Most times, schools will not provide 100% refund of your tuition so you could be risking thousands of dollars of tuition and fees. If you can’t afford the cost of an extra semester be sure to have your families purchase tuition insurance. Tuition insurance has to be purchased before classes begin but is often an affordable way to protect yourself and your education. In addition, watch your habits. If you’re spending a lot of time on Facebook, Twitter, Instagram, Snapchat or Whatsapp, then chances are you’re going to have a hard time breaking that habit when classes start. Start to set time limits for yourself in the weeks before school starts. If it’s hard for you to stick to it, then you know it’s a problem. Check out this article on how to kick your social media addiction. Cari Bennette is a blogger and ghost writer and contributed to the original article in 2015. She works at custom writing service http://jetwriters.com/ and shares her advice on academic writing, grammar and editing. Cari loves to blog about education and college life, follow her on Twitter.